The picturesque Ounila Valley is best explored on foot. 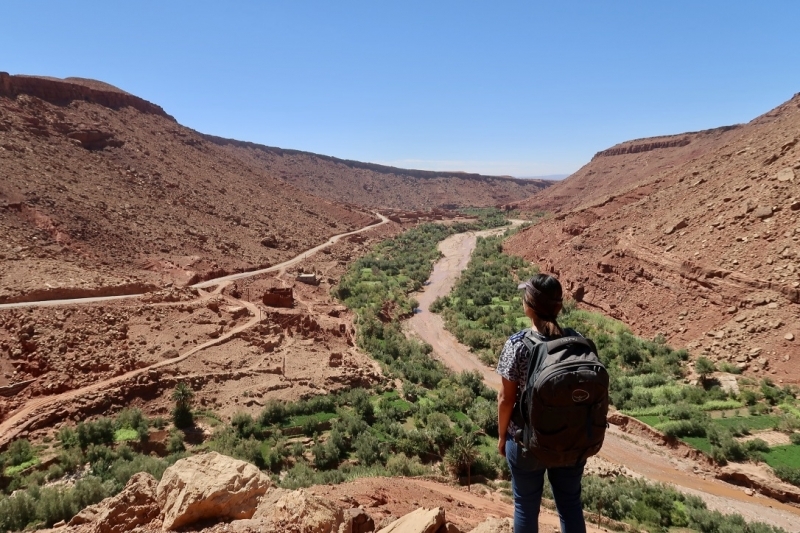 Here’s how a traveller embarked on the journey through the valley from Telouet to Ait Benhaddou across 55 kilometres. 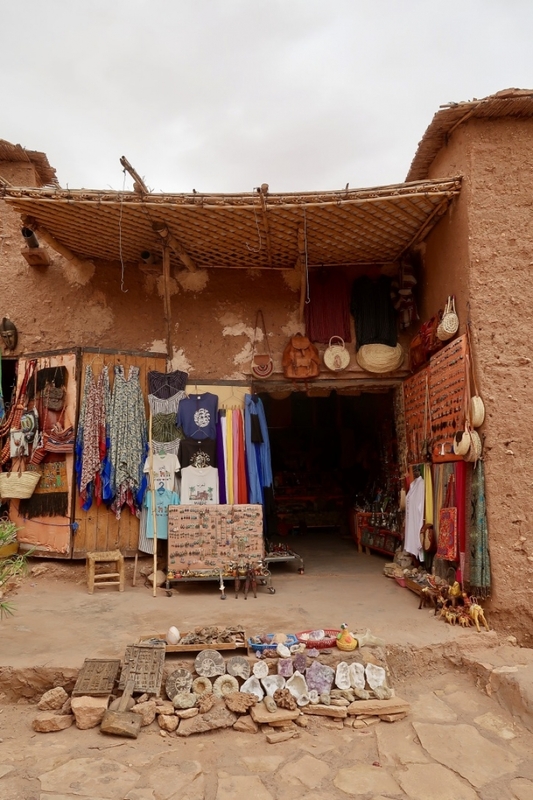 Much has been said about the souks in Marrakech, the tanneries in Fes, the blue streets of Chefchaouen, the dunes of Merzouga, and the ramparts of Essaouira. 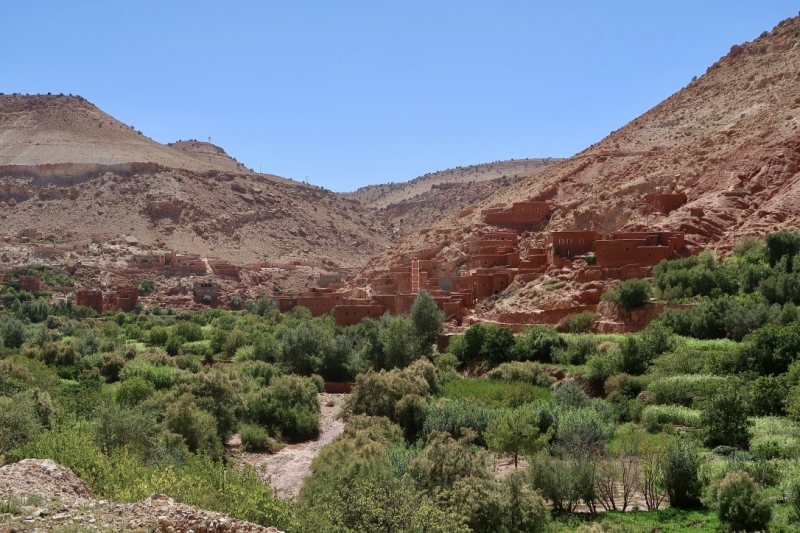 While all these make up the quintessential experiences of the first-time traveller to Morocco, the highlight of my one-month trip was something else altogether: the Ounila Valley. 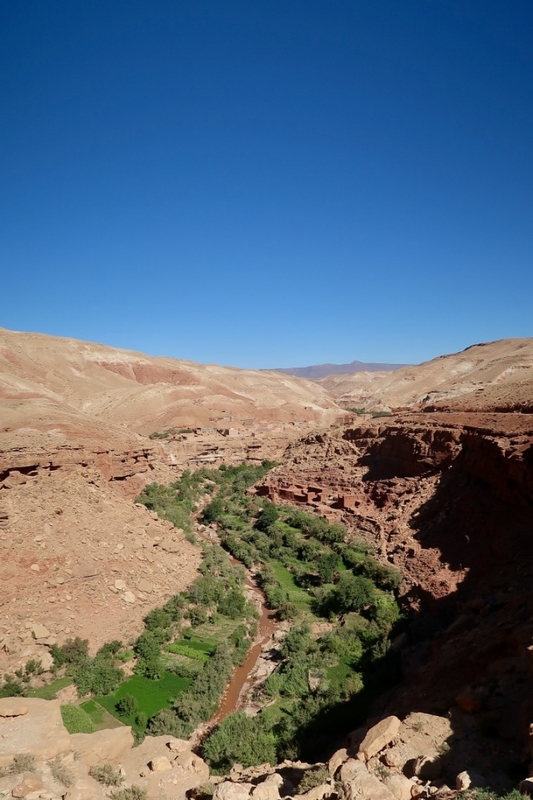 Southeast of Marrakech, linking Tighza to Ait Benhaddou across a beautiful 40-kilometre stretch, is the Ounila Valley. A quiet road (P1506) runs alongside the valley, punctuated by little villages that look lost in time. 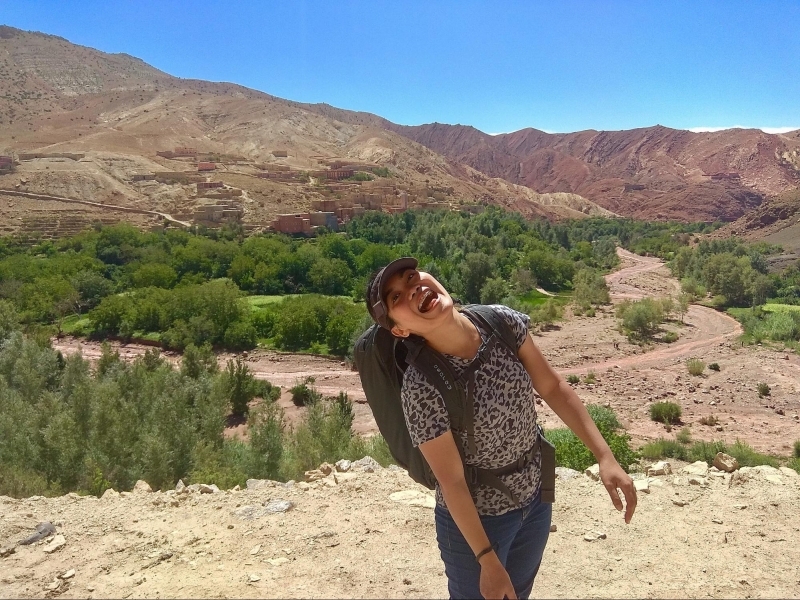 While it takes just one hour to complete the drive, my friend Alex and I had another idea in mind: to walk (or hitchhike) across the Ounila Valley, from village to village, within a span of five days. Historically, this route has been part of the journey of caravans from sub-Saharan Africa to Marrakech and beyond. 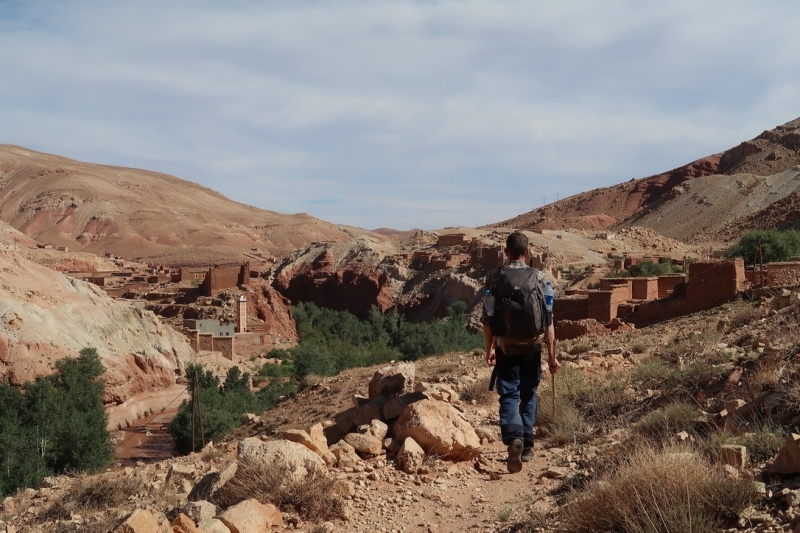 But instead of carrying goods for trade and sitting on camels, we carried our backpacks and trudged our way on foot. Telouet marked the start of our journey. After spending the night in a fancy rooftop room in Auberge Restaurant Telouet, we scored a free tour with a kind local, Ali Ahdadi. 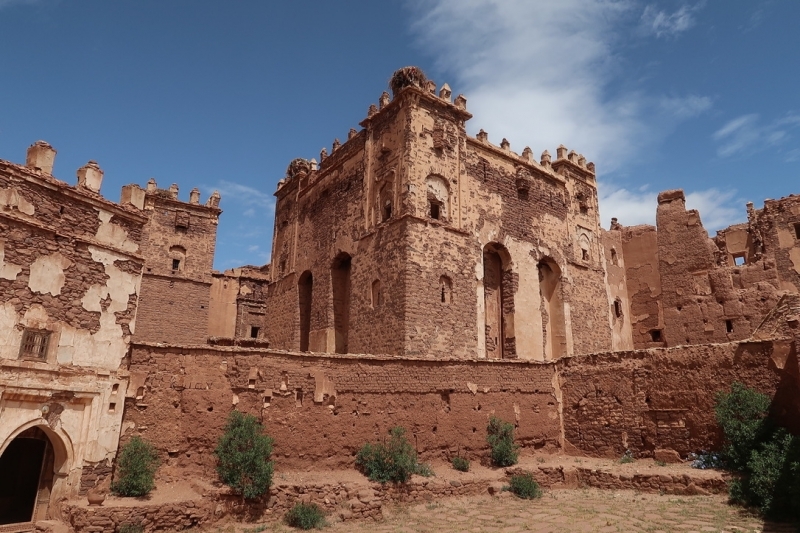 He brought us to the weekly village souk and the Telouet Kasbah, which looks like a huge crumbling palace on the outside but offers glimpses into its yesteryear grandeur on the inside. Then we hit the seemingly endless road that would lead us to the Ounila Valley. The first steps were pleasant. 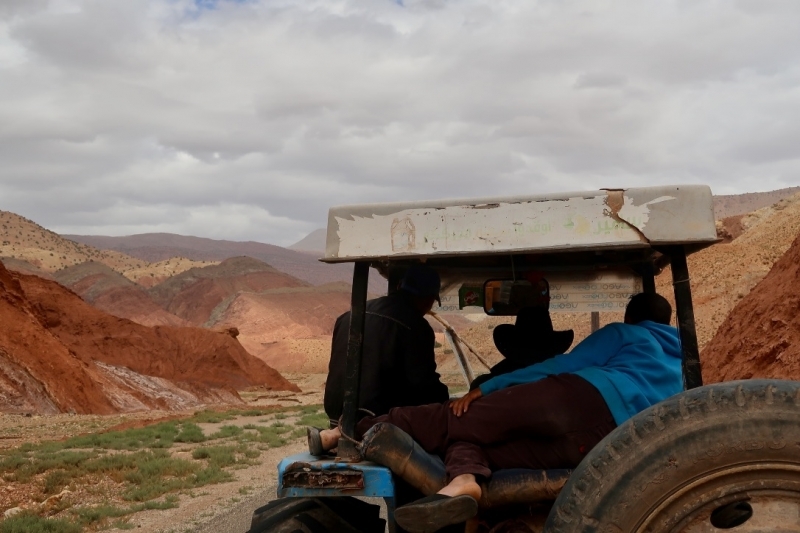 The cloudy skies and chilly winds were in our favour, but when a tractor rolled up behind us, we couldn’t resist to “cheat” a little bit and hitchhike part of our way to Tighza. We sat at the back of the tractor on loose soil and alongside spades and pickaxes, our legs stretched out in front of us. Mounds after mounds of soil in shades of peach, reddish-orange, and grey came and went. The friendly guys in front dropped us off near Anmiter where a dirt path branched off from the road and meandered its way uphill to the mountain village of Tighza. 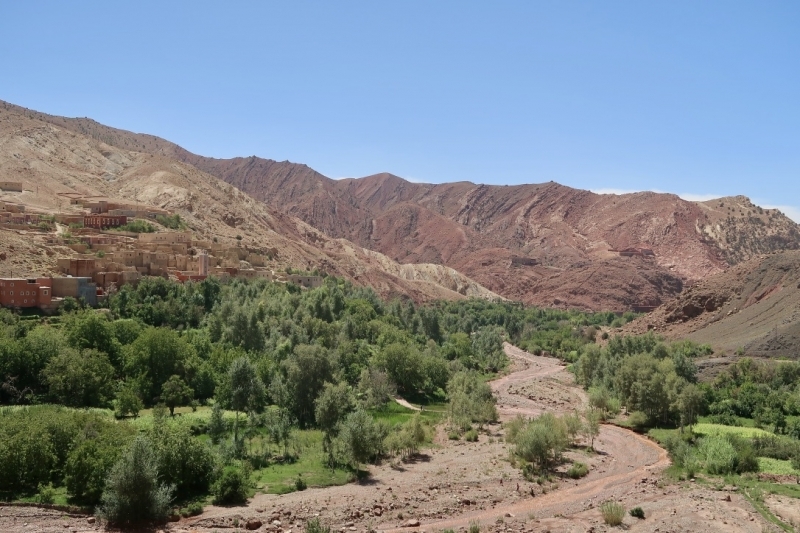 On the way, we caught the first sight of the Ounila Valley; it was an oasis of lush greenery that sprouts from the river, bordered on its edges by a contrast of barren, soil-coloured mountains. We couldn’t pause too long to marvel because ominous clouds were hanging above us. Thankfully, a car stopped for us just as the first few drops of rain trickled down, saving us from a strenuous and muddy climb. Nonetheless, getting drenched was the order of the day. 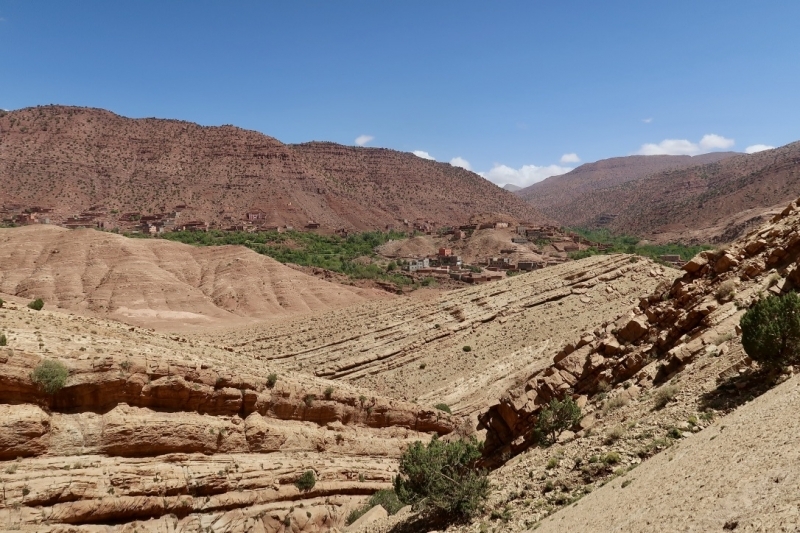 From where we alighted, it was still a long ascent to Riad Atlas Tighza, our refuge for the next two nights. When we reached Tighza, we were soaked to our bones but despite the cold, despite the rain, and despite the fatigue, I could not have pictured a better first day for our journey. Tighza was a dream. By the time dawn broke, the weather had cleared to make way for blue skies. I might have let out a gasp when I looked out the window. From afar, Tighza blended into the mountains behind it; At first glance, your eyes might not make out the blocks of buildings because they are mostly of earthy colours. Down in the valleys, trees bearing almonds, figs and apples thrive in abundance alongside patches of corn fields. 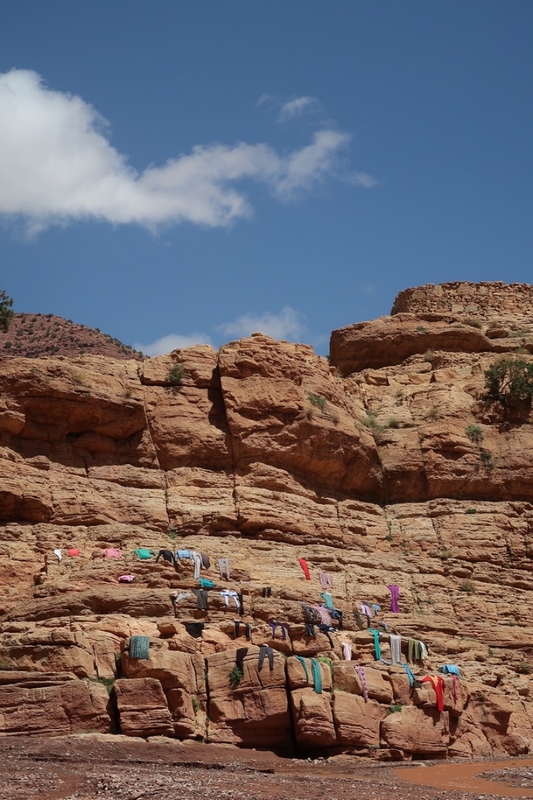 Local women bring laundry on mules to a spot along the river where clear water flows, and they splay clean clothes on rocks to dry them under the sun. It was a world far, far away from the realities I was accustomed to. Despite the charms of Tighza, nothing much has been mentioned online about this little village some 1,800 metres above the sea. We made our way to Tighza only because of the recommendation of Ali. Not surprisingly, Tighza was pretty much devoid of tourists during our stay — and that suited us just fine. We spent the day exploring the area on foot while on a lookout for the prehistoric dinosaur footprints that a local told us about. (Sadly, we did not find it.) We did, however, find intriguing rocks, some resembling quartz and others dotted with glitter that shimmered in the sun. When we returned to Riad Atlas, we were treated to stupendous meals cooked by Idir, the owner himself. We had the Moroccan staples of tajine, couscous and Berber omelette during our stay, always complete with fruits like melons, oranges, grapes and the rather exotic barbary figs. I must share that Alex and I still longingly reminisce about the food we had in the guesthouse to this day. “Let’s go back to Tighza” is now a common half-joke that we share. We set off early the next day after having pancakes, a spread of jam, and the ubiquitous mint tea for breakfast. 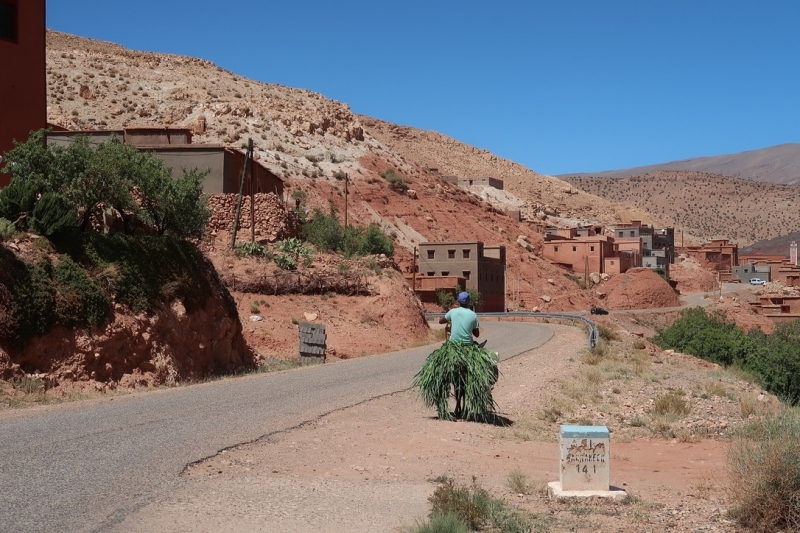 On the five kilometres downhill to Anmiter, we met a cordial local woman who invited us for tea, but we politely declined as a long road lay ahead. 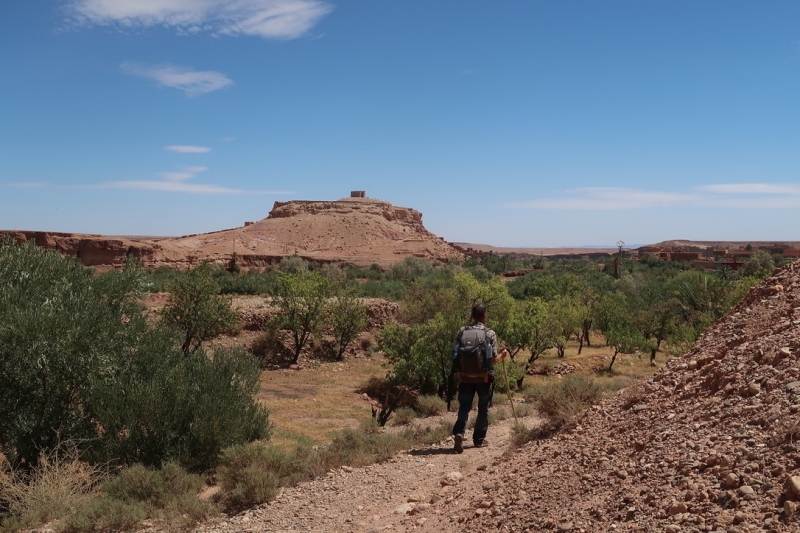 Instead, we trudged on for hours, stopping only at lunchtime when we found a desolate roadside eatery where the owner obliged our request for Berber omelette. Then we continued our walk. Mostly on the road, but we made a detour to the riverside for a change of pace and scenery. 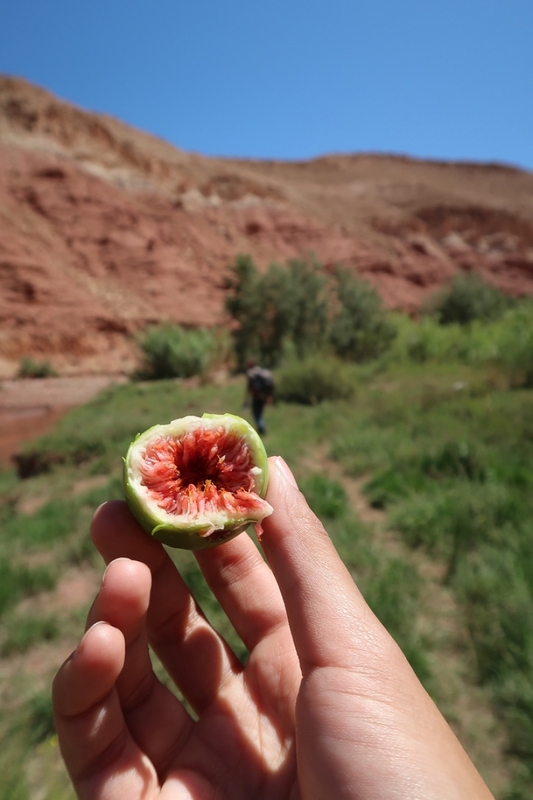 We met a group of giggling, chirpy locals who handed us a handful of figs they had just picked. Soon after, an English-speaking teen sitting on a donkey made his way to us just to say, “Welcome to Morocco”. As the ground by the river was full of shrubs, we improvised walking sticks from tree branches to sweep the way in front of us and check for snakes. The slithering reptiles must have dominated the thoughts of Alex, for he jumped like a kangaroo when a small bush beside his foot was disturbed by a frog. After sharing some laughs, we returned to the comforts of the road. Step by step, we inched closer to Assaka. Towering rocky cliffs loomed overhead, and before we knew it, they were behind us. To our right, luxuriant foliage seemed to mock us; along the road drenched in sunlight, shade comes far and few in between. Every once in a while, a lone car would cruise by, the driver almost always nodding or giving a quick wave before disappearing into a speck. We relished in the knowledge that we were probably the only tourists to walk along the Ounila Valley on that day, or maybe even the whole week. Towards the last few kilometres, we crossed the valley to a mud-brown village on the other side so we could escape the monotony of the road once again. On our way back, I plunged my foot into the river, rendering the final hour an uncomfortable march punctuated by the thud, thud, and thud of my walking stick. When we finally arrived in Assaka, I abandoned the stick and collapsed into the embrace of the living room in Gite D’etape, the one and only gîte (guesthouse) in the village. When we departed from Assaka, we were mentally ready to take on 20 kilometres in one day — the longest stretch for the trip. 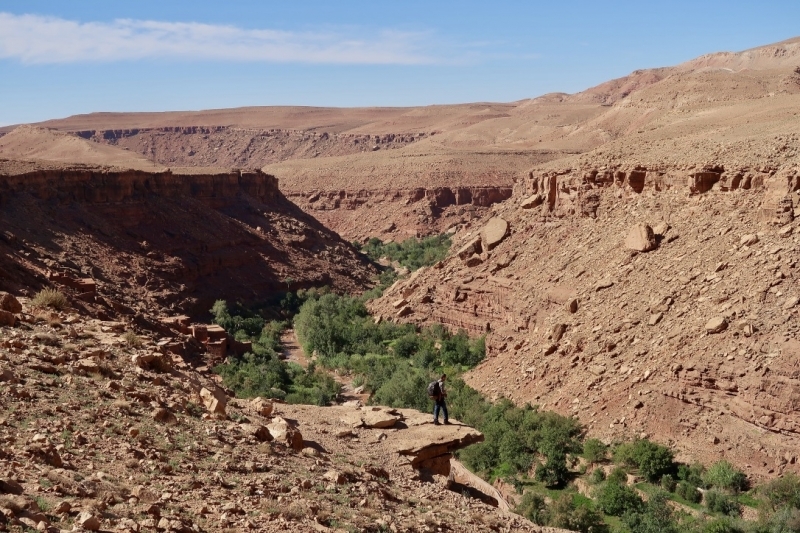 We were almost immediately greeted by astounding views: deep canyons wound its way before our eyes, its slopes emptying into a trickling river lined with trees. We were glad to be on foot because it was surely the best way to take in the views. 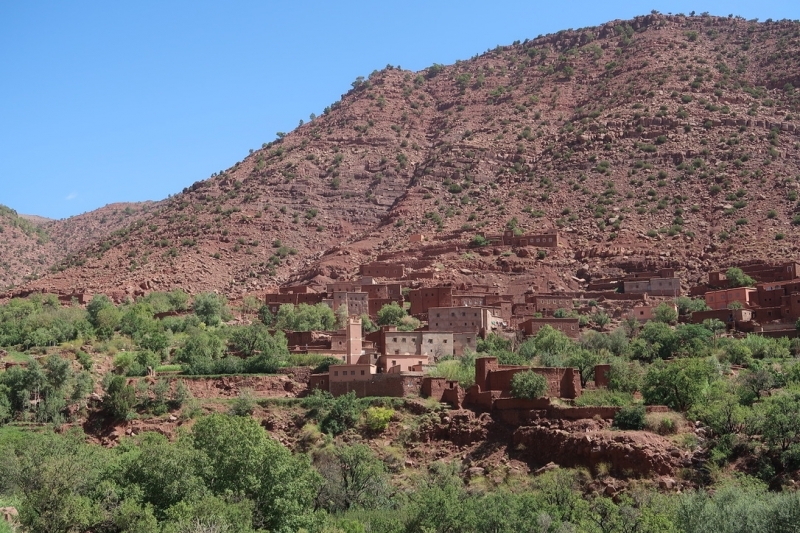 After three hours or so, the village of Tizgui n’Barda appeared in the distance. A board that says “Paradise on Earth” led us to a panoramic viewpoint where we captured images of the village which sprawled from the road above all the way down to the valleys below. 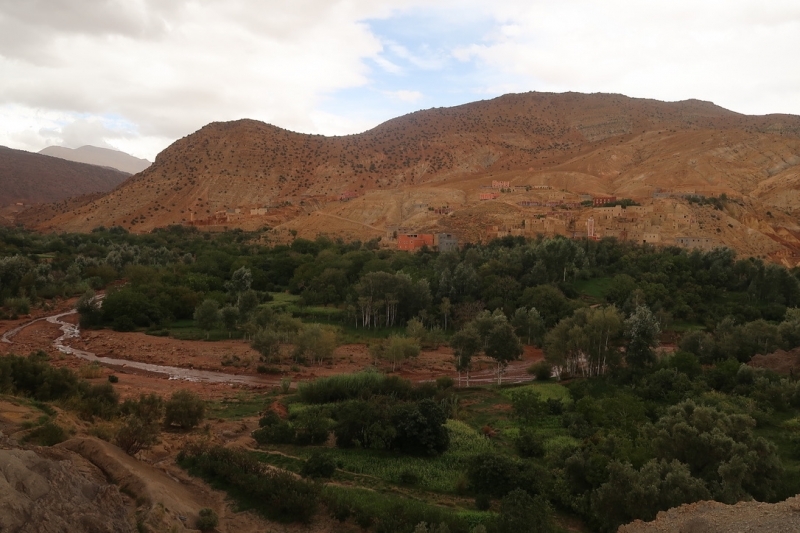 At this viewpoint, we met Abdelah, a villager who had set up a makeshift outdoor stall selling rocks and jewellery. 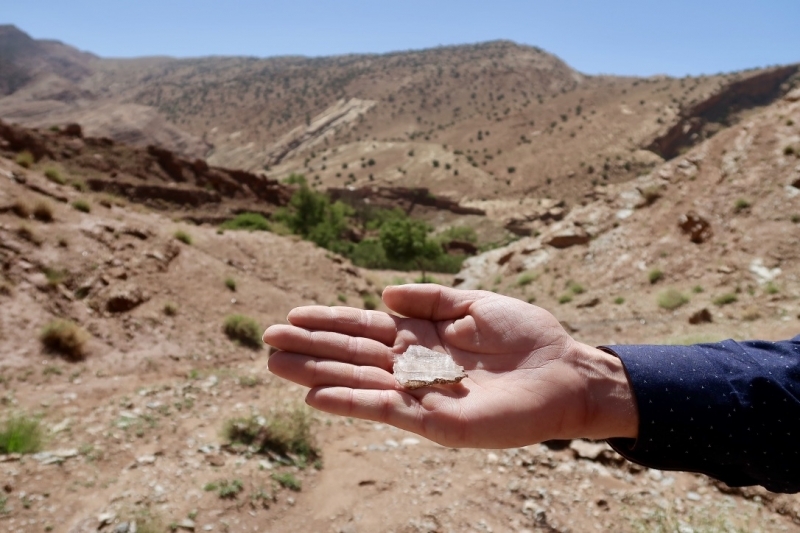 When Alex asked if he knew a place where we could have Berber omelette (yes, again! ), he told us that he runs a gîte and that his wife Khadija will gladly prepare it for us. Much to our delight, he added that it’ll be ready when we meet her in the village below. Just like that, the stars aligned. In Abdelah’s gîte, I had quite possibly my best Berber omelette in Morocco — and that’s saying a lot because I’ve ordered it for countless meals. Berber omelette is basically eggs poached with tomato sauce in a traditional tagine. It’s never the same in two places. Khadija’s Berber omelette was saucy with a hint of coriander, and the eggs were not overdone — just how I liked it. After lunch, we stocked up on water at a tiny grocery shop steps away and continued our way. We had 12 more kilometres to go. Much of the rest of the journey was gruelling. After a certain point, I just wanted to fast forward the time to when I would have arrived in Tamdakhte. I felt the heat pounding on me; I had but a visor, sunglasses, and sunscreen to protect myself from the sun’s rays. Sometimes I could hear the sound of the flowing water, but mostly I heard the shuffling of my feet against the road. Step, after step, after step. We had a short respite in the village of Ait Fars where we refuelled with a bottle of coke and stocked up on candies to hand out to children on the streets. 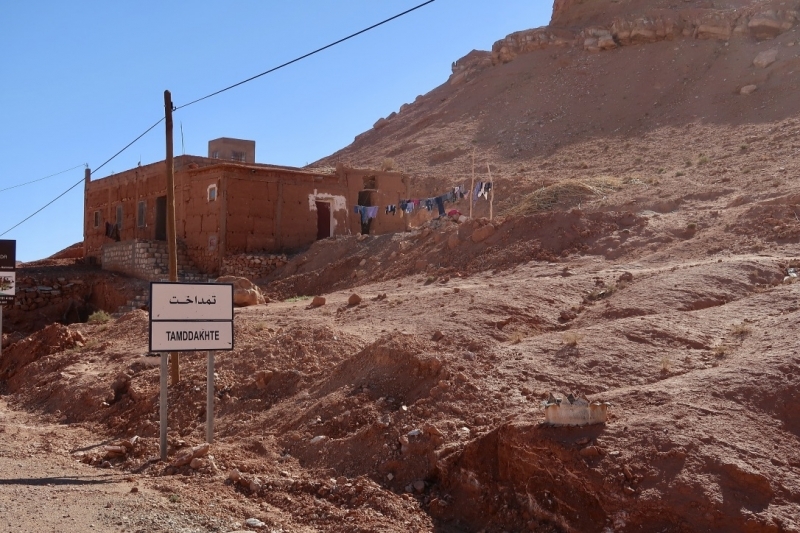 I felt a great sense of relief to finally reach Hisham’s Guesthouse in Tamdakhte, where we were greeted by Hisham’s brother, Said. When dinner was served, Said uncovered the tajine to reveal – as you may now start to guess — another masterpiece of Berber omelette. The day was complete. 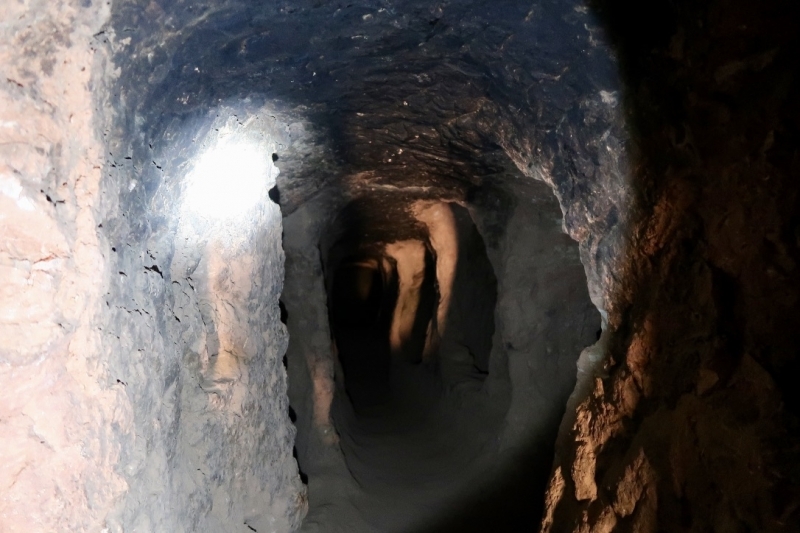 With time on our hands during the fifth day, we spent the morning with Said exploring the mysterious troglodyte caves near Tamdakhte. Built into the cliff face, the cave we entered featured multiple floors, each with a tunnel leading to a series of cave rooms. According to Said, nobody knows the true origins of these caves. If someone claims they do, they’re lying. 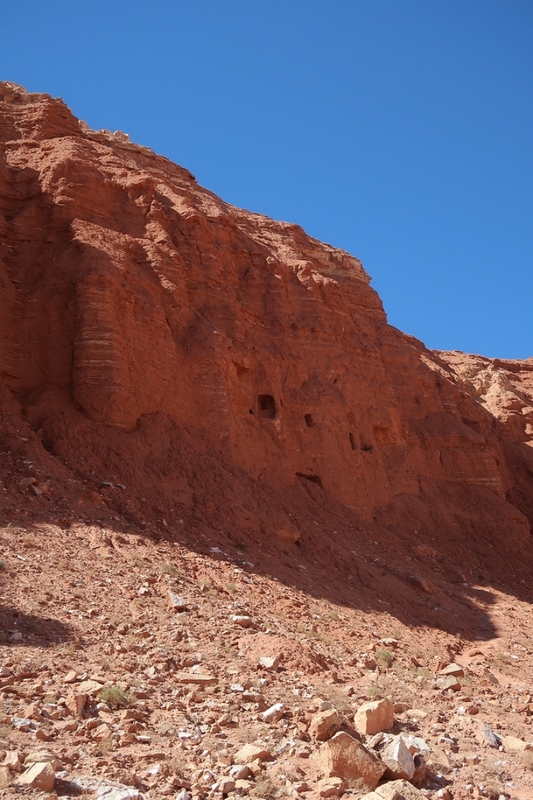 The distance between Tamdakhte and Ait Benhaddou is a mere six kilometres. By foot, it would take less than two hours; by car, just five minutes. I had this in mind as I was sweating it out on the road, which had views that are none compared to the previous days. As tough as it was to battle the heat yet again, we had our minds set on completing the walk without hitching a ride. 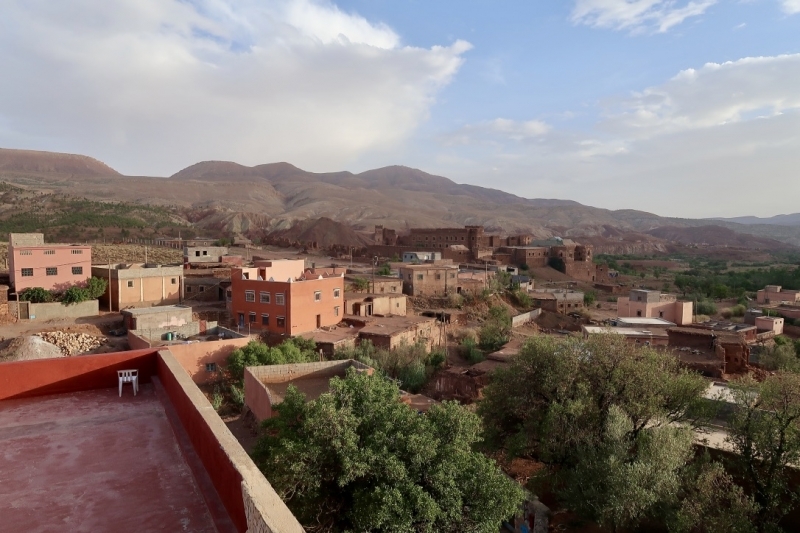 The famous hill topped by a granary in Ait Benhaddou loomed in the background. It was our finishing line. And yes, what is there to say? 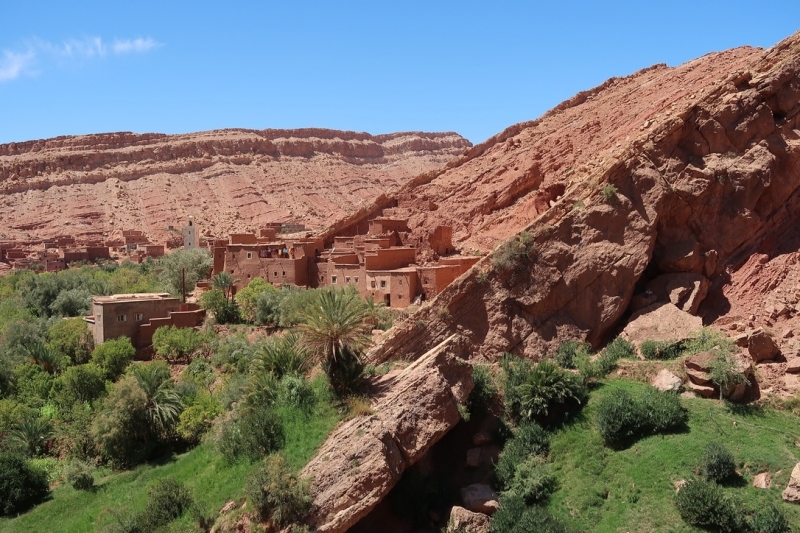 We made it to Ait Benhaddou after five days and 55 kilometres of (mostly) walking. 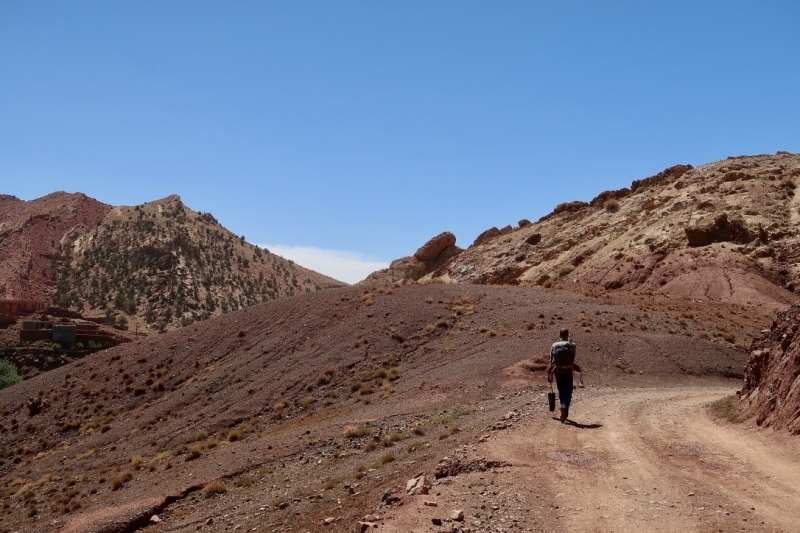 We still had plenty more adventures up ahead, in the Rose Valley, the Dadès Gorges, and up north all the way to Chefchaouen — but given our time constraints, we had to hop on a shared taxi and conclude our first walking journey in Morocco. I reckon that the best time for the journey would be in autumn (September to November) and also spring (March to June). I did it in early September and the weather was generally pleasant — cool high up in the mountains but just a tad too warm down at lower elevations. English is not widely spoken in the villages along the walk. I had no troubles because Alex spoke French, a language that will easily get you by in Morocco, along with Arabic and Berber. If you don’t know these languages, ensure that you have a translation app ready with you at all times. There’s no need to book your accommodation in advance. The bigger villages usually have at least one gîte and the owners will be more than happy when you walk in. On average, we paid around 170 dirhams each for a night in a gîte, inclusive of dinner and breakfast. If you need internet, get a SIM card with data in a big city (eg. Marrakech) before you start the walk. 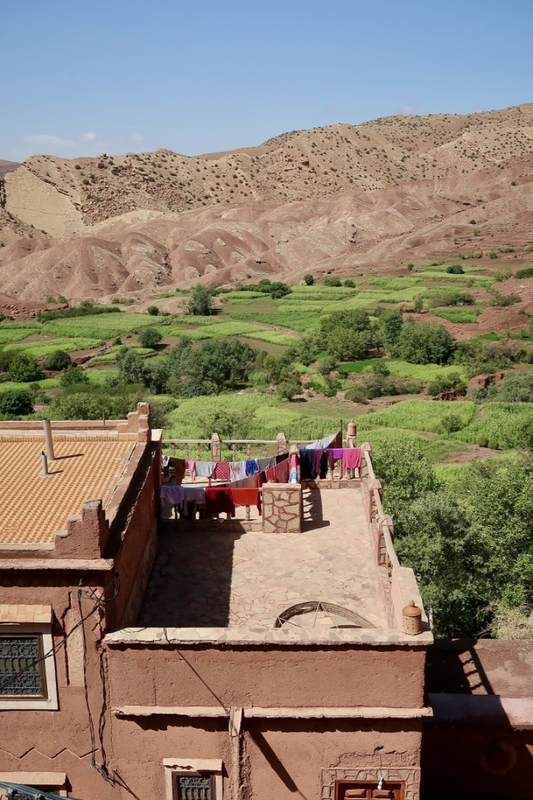 Don’t dream of having WiFi in the remote villages. For navigation, use MAPS.ME, which is available offline. It is more detailed than Google Maps and also displays hiking routes in the vicinity. Don’t carry too many things with you. The bare essentials like travel documents, clothes, toiletries, and electronics will do. Good shoes, a rain jacket, a cap, a bottle of sunscreen, and a portable charger would be good to have. Always bring along sufficient water. Some villages along the way might not have shops, so plan ahead before you depart. The same goes for food. If it seems challenging to find a place for lunch, ask your accommodation to prepare a packed sandwich for you. Last but not least, there’s no need to worry too much if you’re not an avid hiker: I am not one, but I did it anyway! It helped that I spent plenty of time staring at the map each night and internalising the distance I needed to cover the next day as preparation. Certain sections were tough but mostly because of the hot weather towards the end of summer. 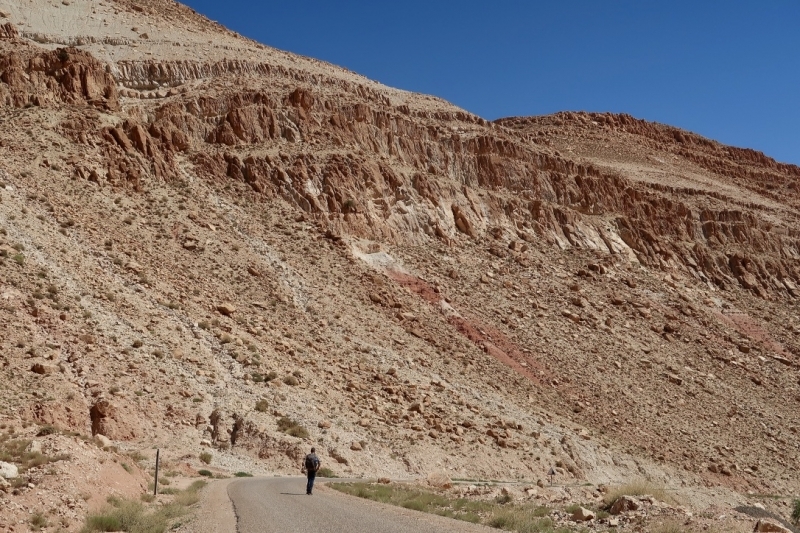 The route itself is mostly flat and scenic, so you can always look forward to a visual feast!